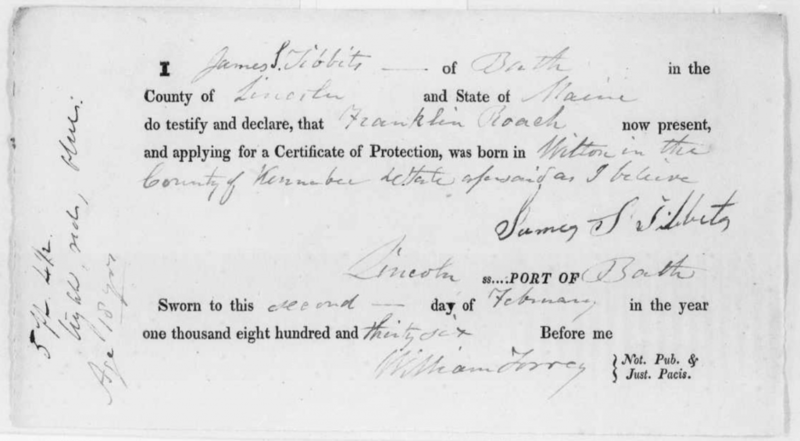 Maine, Bath, Seamen’s Proofs of Citizenship, 1833-1868 is a free collection at FamilySearch with an index and images of proofs of citizenship used to apply for Seamen’s Protection Certificates* at the ports of Bath, Maine in 1833, 1836, 1839-50, 1853-65, 1867-68; and at Portsmouth, New Hampshire in 1857-58. *Seamen’s Protection Certificates were printed or partially printed documents used as I.D. for American seamen as proof of citizenship and were sometimes required in foreign ports. What Can I Learn from Maine Proof of Citizenship Records?